Often lost in the myriad of great holes at Augusta National is the spectacular short par 4 3rd. "Flowering Peach" has remained almost identical to MacKenzie's original design throughout the years. 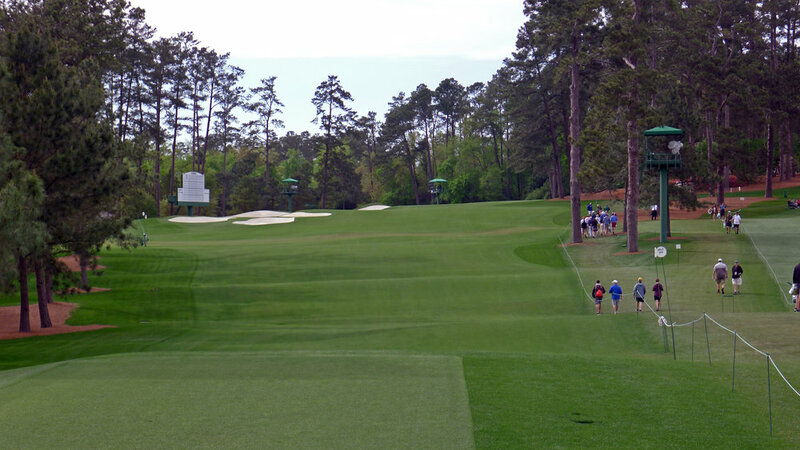 Although it is only 350 yards, the 3rd can play as one of the tougher holes at Augusta. In a game where power rules, the third has managed to stem the tide and provide an interesting and equal test for all types of players. Option A - Layup short of the bunkers leaving a full wedge into the green. Option B - Drive it past the the bunkers into the valley short of the green. Player has a short approach in. Option C - Under the right conditions and with enough length, players can give the green a go. The best option changes from day to day based on the pin position and wind direction. These options change and because MacKenzie used a few simple design features. The green - MacKenzie perched the shallow green beautifully on a small ridge. The green has numerous interior contours but the general movement runs away and the left of players. The green has three distinct sections, the front left, front right and back right. Each changes the strategy and ideal play off the tee. The margin of error on the approach to the 3rd is razor thin. Any short or long will run off the sides of the perched green. The green's internal contours are complex and intricate. They create small pinnable sections that reward excellent great shots and lead to difficult pars for players who miss slightly short, long, right or left. The green's shallow nature and front to back slope make make the semi-blind half wedge from option B and A a difficult task. It's especially tough when the flag up front or on the left portion. The bunkers - Originally, Augusta National only had 22 bunkers. The third hole had one large bunker on the left side that guarded the ideal angle to approach the green. Today there are four bunkers that occupy that spot. To clear the bunkers it's a 280 yard carry from the tee. A popular play is option A, a layup with an iron that leaves a full wedge shot from the top of the ridge. Each of these features and the day's pin position play a role in how players play the hole on a given day. Augusta typically uses the four pins illustrated by the graphic above. The front pins play the most difficult because of the ridge that the pin is placed on. It sends any shot slightly short tumbling down the front ridge. The front right pin plays easier because players are able to use the contours right of the green to funnel shots in. The ideal play off the tee is up the left side of the fairway near the bunkers or going for the green and missing long. The back right pin is the easiest pin because it gives players space to play a low spinning wedge from option B . Players have to use caution when approaching, a miss long from an aggressive wedge shot is almost guaranteed to make bogey. For this pin the ideal approach comes from option B. The traditional Sunday pin is out on the small left point of the green. This is typically the most difficult pin. The contours in front and behind the green can scurry shots long or short. From short, the chip is up a steep hill, long contends with a smaller slope but a green that runs away. If conditions are right, Sunday leads to players bombing away at the green, in hopes of an eagle to jumpstart their comebacks. The ideal play for someone in contention is up the right with an iron to open up an angle to the green. Augusta National's third shows that short doesn't mean easy. It's front to back sloping green, impactful fairway bunkering and use of the land combine to create a symphony of options and strategy. It requires thought and execution to tame and intact from Alister MacKenzie's original design.